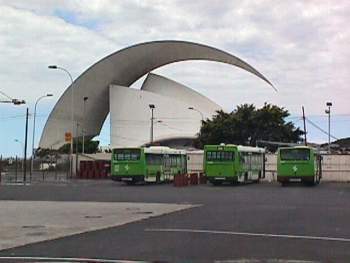 Today is an adventure - we are going to try to go right around Tenerife on the guaguas (the Titsa public buses). Have a look at the map on the homepage. 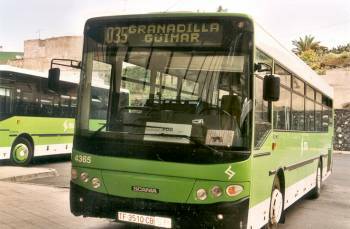 This is a guagua, pronounced huahua. This is what we have used for all our traveling around Tenerife. There have been a few hiccoughs but on the whole very reliable and much cheaper than bus tours. The buses are modern and comfortable (many have air conditioning) and are unbelievably punctual. The network covers the whole island, even quite out-of-the-way corners. If we buy Bono tickets in advance, we get a discount of 30% to 50%. 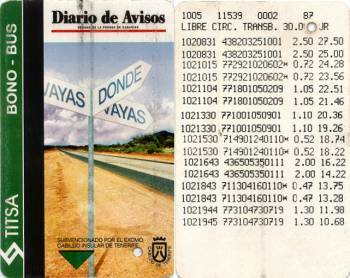 For the 2 of us it cost €19.32 (less than US$20) to travel right around the island, including our excursion to Punto del Hidalgo. It took us 12 and a half hours. We did it and were back in time for a late dinner! 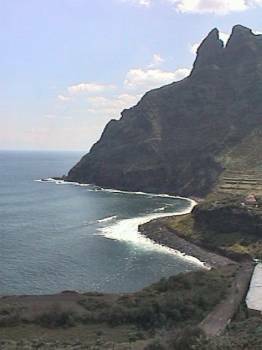 Punto del Hidalgo. There were several people surfing. We are a few hundred metres above the shore; those are really big waves. 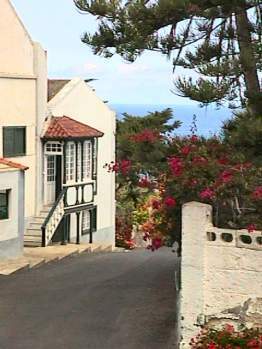 Barranco Flandes. 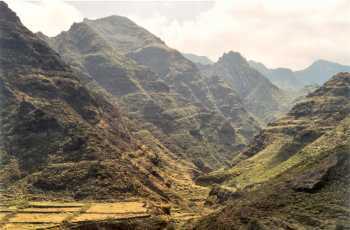 The mountains at the northeast corner of Tenerife are very old and none of these peaks are over 1000 metres. A pretty corner of Punto del Hidalgo town. We had lunch in a pleasant little family restaurant - fried-potato omelet and a very good local red wine. Taking the bus has many advantages. Santa Cruz bus station. In the background is the new theatre (under construction). We had almost an hour to wait for the bus and thought about a quick look at the town (the capital of Tenerife) but it was very hot, so we settled for a cold drink in the modern bus station cafeteria. 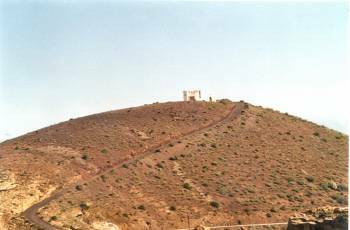 Fasnia monastery south of Guimar. The south coast is very dry and, without irrigation, it is virtually a desert. View from the bus window - south coast. 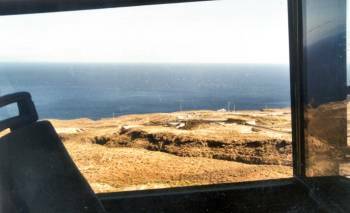 On our trip around Tenerife, we saw La Palma (northwest of Tenerife), Gran Canaria (southeast), El Hierro (west of La Gomera) and La Gomera (west); Lanzarote and Fuerteventura are too flat and too far away to see. 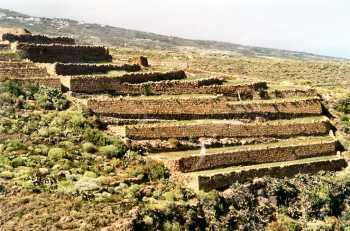 Terraced fields. A lot of wine is produced. Most is quite light but delicious, especially chilled on a hot day. 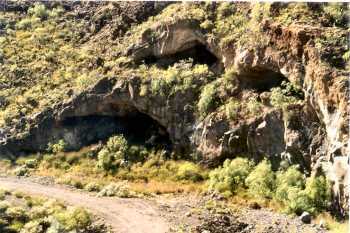 Lava tubes beside the road. 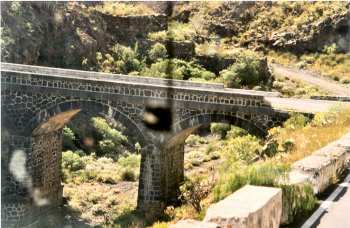 Bridge over a barranca. We are somehow going to get around that corner and cross the bridge. We avoided the super highway and took buses along the back roads between small villages. The roads are good but very twisting. The bus drivers are extremely good, especially coping with some of the tourists who are completely unprepared for driving the difficult mountain roads. It was a long day but fabulous scenery and well worth the effort.